Everyone tries to avoid accidents, but being careful and planning ahead only help so much. After you prepare a First Aid kit, you must have the skills, tools, and know-how to help yourself or someone else. This part of our online certification course will help you understand what to do in the most commonly faced situations. At the end of this section, you will take a quiz that will summarize and highlight what you have learned. Did you know that a human bite is generally more dangerous than an animal bite? This is because human saliva can contain many more types of bacteria that cause infection. However, when a person is bitten by a wild animal (e.g. a squirrel, beaver, armadillo, raccoon, etc.) the victim will need a (current) rabies shot. These shots usually last many years before another one is needed. Bites from domesticated pets and animals can be very painful. However, they generally do not require a trip to the hospital. Unless there is serious bodily injury, the following procedure should be implemented. Wash the area with anti-bacterial soap and water, so you can completely clean the bite wound area. Use Neosporin or another, over-the-counter antibiotic ointment to aid in preventing infection. When a bite wound breaks the skin, use a sterile bandage and be prepared to replace the bandage as needed. The victim might need treatment for a puncture wound (see below) if the bite is deep. Bruises on the skin occur when there is a contusion caused by escaping blood. This blood comes from the vessels near the surface of the skin and usually looks like a purple or greenish spot. Older people tend to bruise more than adults and children because our blood vessels become more fragile as we age. Therefore, if a child has a lot of bruising, it may indicate a more serious injury and should be taken more seriously. When someone suffers a bruise on their head, they should be examined for head trauma. Have the victim apply an ice pack, a bag of ice cubes, or even a bag of frozen vegetables to the area for 30 to 45 minutes. Depending on how bad the injury is, this procedure should be repeated several times a day for a few days until the swelling goes down. Burn victims require different forms of treatment based on how bad their burns are. 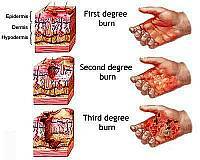 Burns are divided into three categories: 1st degree, 2nd degree, and 3rd degree. Here are these three types of burns and instructions on how to care for them. 1st Degree Burns: Redness and some swelling of the skin. Cool the effected area as quickly as possible. Do this by putting the injury under running, cool water. If it isn't available, then use something else such as a bucket of cup of water or a wet compress. If you can cool the burn and keep it cool, it will reduce pain and speed the healing process. Remove clothing or jewelry that may get in the way of the injury. After the burn is cooled, apply fresh Aloe Vera, Aloe Vera extract or lotion, or some moisturizing lotion. Keep the area loosely dressed with sterile gauze. 2nd Degree Burns: Deep, intense redness of the skin with swelling and blistering. Each 2nd degree burn should first be treated like a 1st degree burn. However, since there is greater damage to the skin, you should take special care to avoid infection and scarring. Make sure to replace the dressing and keep the area clean by changing the dressing daily, using warm water and soap to rinse the area, and an antibiotic cream. If the victim's blisters break open, carefully wash them with soap and water. 3rd Degree Burns: May appear charred or ash colored, could begin to peel or blister. 3rd degree burns are the worst type of burns because they do the most damage to the victim. These burns may look and even feel harmless because the burn may have destroyed important skin layers (e.g. nerve endings) that send messages of pain to the brain. Call 911 was quickly as possible. When a victim's clothing is on fire, throw water or another non-flammable liquid on him to put it out. Do not try to remove burnt clothing as this could cause further injury and infection. Cover the victim's burns with a wet, sterile cloth and his pain and swelling will be reduced. Some victims go into shock and lose consciousness. If this happens, you'll need to perform CPR until he regains consciousness or until help arrives. When a foreign object becomes stuck in a person's windpipe, they will choke. Choking victims often panic because they realize they cannot breathe very well, so try to keep the victim calm. Carefully assess the situation. Even when it's obvious, it's always wise to ask someone if they are choking. If they are choking, they will probably not be able to respond. If they gasp for air, point at their throat, or start to turn blue, you can conclude they are choking and they will need you to perform the Heimlich Maneuver. Approach the victim from behind and plant one of your feet between his feet for stability. After you put your arms around the victim from behind, make a fist with one hand, just above his belly button. Press toward your body in quick thrusts, going upward as many times as you need to successfully clear his windpipe. Call 911 if the victim cannot breathe after you perform this technique several times. 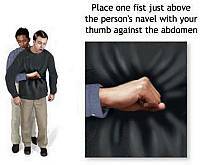 Follow their instructions and be prepared to continue performing the Heimlich Maneuver until they arrive. The first and possibly most important step when treating minor cuts and scrapes is to thoroughly clean the wound with mild anti-bacterial soap and water. You can use sterilized tweezers to remove any debris that remains embedded in the wound after rinsing. This will reduce the risk of an infection and possible complications. If the debris is abundant or can't be removed for some other reason, a trip to the emergency room will be necessary. Water may induce bleeding by thinning the blood. If while rinsing the wound you notice increased blood flow, use gauze or a clean cloth to apply gentle, continuous pressure until the blood clots. Although hydrogen peroxide is commonly used as a disinfectant for minor cuts and scrapes, it is actually not very effective and may even delay the healing process by irritating a person's living cells. You can use hydrogen peroxide but apply it around the open wound, not directly to it. An antibiotic ointment such as Neosporin is a better alternative - it will keep the wound from getting infected and speed up the healing process. Dress the wound with a bandage or sterile gauze to keep dirt and bacteria out. Change the dressing frequently and rinse the wound as often as necessary to keep it free of dirt. Continue to monitor the wound for several days. If the injured area turns red or puffy, or if excessive pain persists, then it may've become infected and will require a physician's attention. Do not simply dismiss cuts as minor injuries as some may be quite serious if not tended to by a professional. If the wound is very deep or the bleeding is profuse, it may require stitches in order to heal properly. As electricity tries to reach the ground, many different materials will allow the electricity to flow through it as a conductor. Electrocution, on a small level, can be a common household hazard because humans actually make great conductors! In most cases, medical attention is not necessary. However, it's important to be careful and take precautions, so serious electrocution doesn't alter the body's electrical impulses that guide the heart, brain, and other bodily processes. One of the effects of exposure to harmful electricity for a period of time is burns to the skin and underlying tissues. When you approach an electrocution victim, be very cautious and assess the situation carefully. If the victim is still in contact with the electrical source, he will be a conduit and could easily expose you to the electrical current. Don't put yourself in danger, but try to turn off the electricity. If you are unable to do so, use some non-conductive material like dry wood or plastic to separate the victim from the electrical source. When the victim's injuries seem serious, call 911. Consider whether or not the victim needs CPR. When you examine his vital signs and you discover he isn't breathing, begin CPR right away. Examine the victim's body for burns and follow the procedure outlined above for 1st, 2nd, and 3rd degree burns. Make sure the victim doesn't go into shock by making him as comfortable as possible. Keep his feet elevated after laying him down and keep an eye on him. Fractures are broken bones and may not always be obvious. 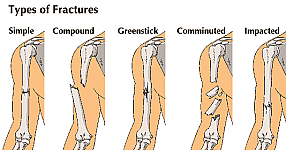 Compound fractures are much more obvious because the bone breaks the skin. Consequently, it's important to correctly ascertain whether there is a bruise, a sprain, or a fracture. Here are some symptoms of fractures. Great pain is felt with minor contact or slight movements. Call 911 right away and use a splint to keep the broken bone stable. If you don't have a store-bought splint, you can use a variety of materials (e.g. plastic, wood, etc.) to make one. Just make sure the splint is longer than the broken bone. Wrap the splint to the broken bone with cloth or gauze, but avoid wrapping it too tightly or it could hinder blood from flowing. Some people have even used a newspaper or magazine wrapped in cloth or gauze to stabilize a forearm fracture. However, a fracture in the victim's lower leg will require two splints - one splint on each side of the wound. If you're unable to find material for a splint, as a last resort, you could use the victim's other leg as a splint. "I" ce - Applying ice (e.g. an ice pack, ice cubes, a bag of frozen peas, etc.) to the injury will help reduce swelling and pain. "C" ompression - When a wound is still bleeding, apply pressure to it with a clean cloth or rag and it should eventually stop. "E" levation - Do your best to keep the injury above the victim's heart because this will also reduce or minimize swelling and blood flow. When you determine a victim is suffering from a serious head injury because he displays some of the symptoms above, he will need medical attention. Call 911 immediately. Do the following until help arrives. Have the victim rest in a quiet area without much light present. Have the victim lay flat, elevating his head and shoulders. Stop the bleeding and dress the wound with a clean cloth or gauze. Be prepared to perform CPR if the victim loses consciousness. Our noses have many small blood vessels in them that can be damaged easily. Nosebleeds can have a variety of causes such as being hit in the nose, falling on your nose, or even breathing very dry air. When your nosebleed is not a symptom of a serious injury, it probably won't be dangerous and probably will be easy to stop by applying pressure. When a nosebleed isn't a symptom of a serious injury, it's almost never dangerous. 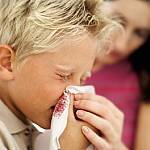 Applying pressure will usually stop the nosebleed and it will rarely be dangerous or cause to see a doctor. Consider the following guidelines when approaching nosebleeds. Avoid tilting the victim's head backward. Ask the victim to either sit up or stand up, so the blood flow will slow. Remove or at least loosen tight clothes or jewelry around the victim's neck. If the victim can expel excess saliva by spitting, it may help the blood clot and may help him avoid nausea. Ask the victim to (or help the victim) pinch his nostrils shut. Pressure must be maintained for 5-10 minutes before checking. After the bleeding stops, tell the victim to avoid straining himself or blowing his nose for about an hour. Call 911 or take the victim to the emergency room if his nose continues to bleed, if the blood flow is excessive, or if he feels weak or faint. These are signs that there may be a more serious problem that needs to be examined and treated. Puncture wounds can be painful and need to be treated, even if they don't bleed a lot. If they are not attended to, the victim may suffer and infection and even more serious problems. Please don't take puncture wounds lightly. Bleeding can be heavy from bite wounds that puncture the victim's skin, so they should be taken seriously. It is important that the victim clean his or her injury with anti-bacterial soap and water, then visit a doctor as soon as possible. A tetanus shot may be necessary if the victim suffers a puncture wound from stepping on glass or nails. Plus, these sorts of injuries may become infected easily. If the victim cannot remember when he or she got a tetanus shot, it may be wise to get another one and play it safe. While the above puncture wounds can require special care, most puncture wounds are minor and should simply be cleaned with soap and water. Use an antibiotic ointment the speed healing and reduce the chance of infection. These sorts of wounds should be dressed with a sterile bandage and the bandage should be changed frequently. Puncture wounds need to be examined frequently, so the victim can avoid infection. If the wound becomes red or puffy, he or she should see a doctor immediately because it is likely infected. Plus, a foreign object may even be stuck under the victim's skin. The following statements are either True or False. Please write your answers on a piece of paper, so you can check them against the answers on the next page. 1. Being bitten by an undomesticated animal never requires a tetanus shot. 2. Infections can come from minor bites. 3. Fractured bones should be treated by a doctor right away. 4. Broken bones are always compound fractures. 5. Children and adults bruise quicker and easier than older people. 6. When the victim has a head bruise, you should check his head for trauma. 7. A 1st degree burn is the least serious classification. 8. A 3rd degree burn never requires immediate, medical attention. 9. Before you perform the Heimlich Maneuver on a choking victim, you should always ask if he wants assistance or not. 10. If the Heimlich Maneuver doesn't help, keep performing it and don't worry about calling 911. 11. The best way to prevent infection is to use Hydrogen sulfate. 12. Scrapes and cuts don't need to be cleaned with soap and water. 13. Electrocution is often dangerous and/or life threatening. 14. Dry plastic, glass, and wood are good conductors. 15. 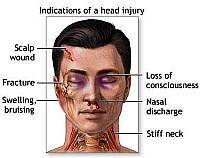 When a victim sustains a serious injury to his head, it will require immediate, medical attention. 16. CPR should be performed on a head injury victim who loses consciousness. 17. A nosebleed is always a symptom of a serious head injury. 18. A nosebleed cannot be stopped without medical attention from a doctor. 19. A puncture wound usually bleeds very little. 20. Puncture wounds sustained from animal bites are never very dangerous. Click here to see how you did and get your certification card!